Given my fondness for eggs in any form (Silken Scrambled Eggs, Salmon Eggs Benedict), Alicia thought that baked eggs would be right up my alley. I had never heard of baked eggs, but Alicia has great taste, so I decided to humor her. “Let’s bake some eggs,” I said. What came next was a smooth and decadent breakfast totally unexpected and indulgent. Baked eggs, also known as shirred eggs, are somewhat reminiscent of poached eggs in their creamy texture and bright flavor. They are really quite unique, and Mark raves about their “custardy texture.” They are baked in small ramekins; Alicia had the fortune to find a nice pair lately, and we enjoy finding innovative uses for the two-tone ceramic bowls. They are great for soups but bad for birdbaths. And perfect for baked eggs! Part of the allure of these baked eggs is their versatility. They can be baked with anything that strikes one’s fancy. 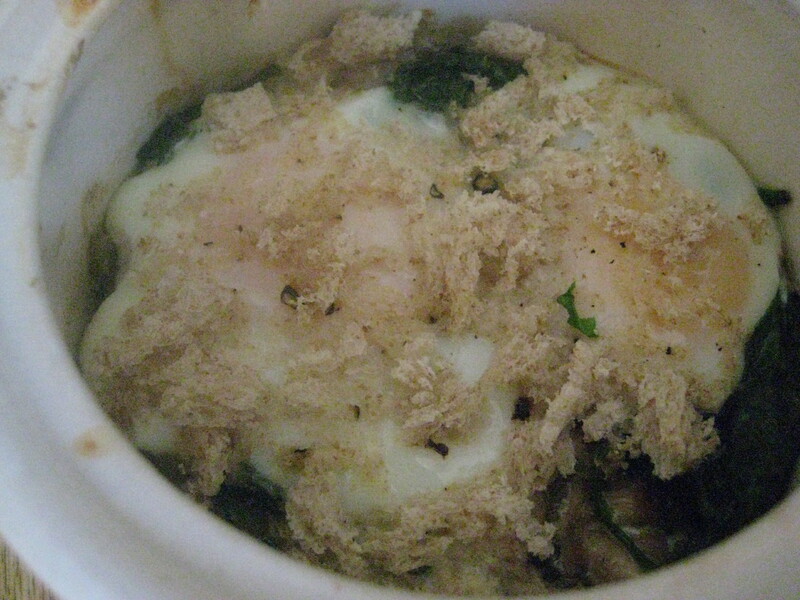 We chose to sauté spinach, mushrooms, and shallots, which go great with the luxuriant egg. We also poured some cream and crumbled some bread crumbs before baking in the oven, which provided an interesting textural complement to the silky egg. We would further like to experiment with tomatoes, which would offer a refreshing brightness. One of the virtues of baked eggs is their ease. We sautéed the vegetables for a few minutes before filling the bottom of each ramekin with them. We cracked two eggs onto each vegetable bed, being mindful to keep the egg near the center of the ramekin. After pouring the cream and crumbling some bread, we simply slid them into the oven for ten or fifteen minutes for some of the most delicious and creamy eggs I’ve ever tasted. Heat the oven to 375. Smear a bit of butter or oil in small ramekins. Add about a tablespoon of oil or butter to a skillet and turn to medium heat. Add the shallot and stir constantly, cooking it until translucent, about 1 minute. Add the mushrooms and saute 1-2 more minutes until the mushrooms are mostly cooked through. Add the spinach and allow it to wilt. Season the vegetables with salt and pepper to taste. Line bottom of ramekin with the vegetables. 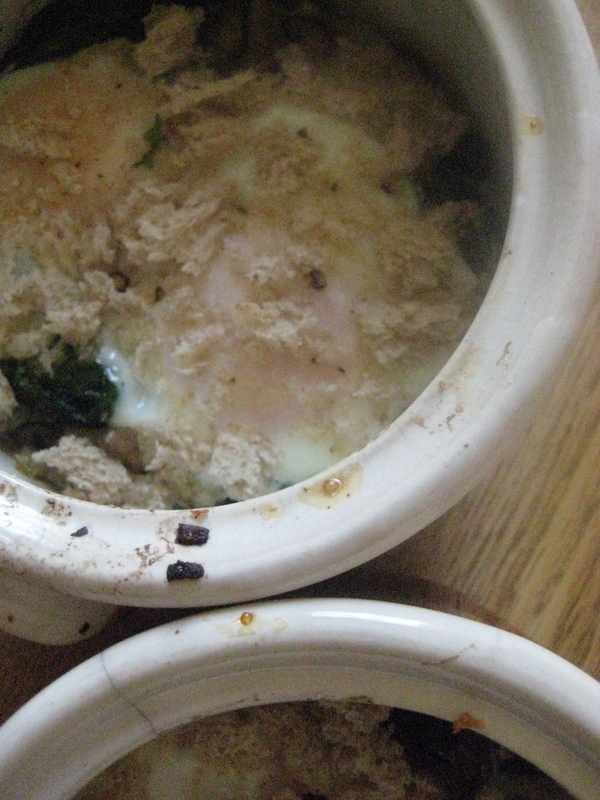 Crack 1-2 eggs into each ramekin. Make sure to crack the egg so that the yolk is in the center. If the yolk sits against the ramekin edge, it cooks too quickly. Add cream, bread crumbs, and salt and pepper to taste. Place ramekins on a baking sheet. Bake for 10 to 15 minutes or until the eggs are just set and the whites are solidified. Because of the heat retained by the cups, these will continue to cook after to remove them from the oven, so it’s best to undercook them slightly (the precise time, in a good oven on a middle rack, is 12 minutes). Sprinkle with additional salt and pepper if desired, and serve.